I don’t know if I ever would want to write another book but it strikes me that one full of mug cakes would be a good wheeze if I did. Only the mug (and a whisk) to wash up, a quick zap in the microwave and hey presto you’ve got pudding. Microwave sponge can be rather hit and miss. My first attempts doing this were rather pallid banana affairs but pumpkin mug cakes were a revelation. The addition of pumpkin improves the colour, making up for the lack of oven toasted golden crust on a traditional sponge. A spoonful of Nutella melts inside. Drench with molten chocolate and you’ve an individual portion of a presentable dessert you might otherwise have slaved ooh, at least an hour on. I still need to experiment with sizes… this particular mug cake was driven by my falling in love with these spotty mugs and they’re rather large. If you were to divide the mixture between two smaller mugs you’d have enough for two people. Or maybe half the recipe using a small egg instead of a large one. I’ll get back to you on that, I never buy small eggs so would need to try it. But it’s all a far cry from the fare of my current favourite baking show – Qui Sera Le Prochain Grand Patissier? Currently being aired on international French digital channel TV5 Monde on Saturday nights but apparently also available on YouTube, imagine Masterchef Professionals with the contestants wearing tall white chefs’ hats and only dessert on the menu. It makes Great British Bake Off look like a school fete in comparison. Episodes are two hours long and contestants typically have seven to ten years’ patisserie experience in high end restaurants. One contestant I saw had fifteen years’ experience and was only thirty. The French take their baking seriously. Yet… the French have also been obsessed with Les Mug Cakes for the past two years. On holidays walking into LeClerc or Hyper U, I can be sure to spot at least one mug cakes book and in several places I’ve found half a dozen different versions. Les Mug Cakes Party. Les Petites Mug Cakes. 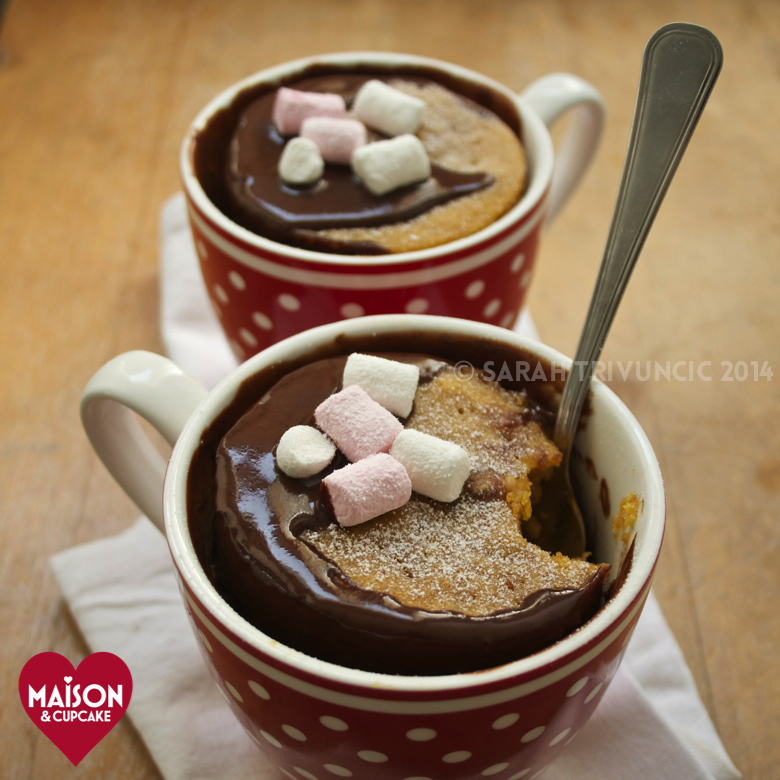 On-y-va faites Mug Cakes. It seems in France at least, le mug cake has truly replaced le cupcake. And I can see why. Taken with a craving for cake, not only do you get it within a few minutes but you aren’t landed with twelve of the things. Experimenting with mug cake recipes merely requires a new clean mug and more ingredients rather than washing up a heap of equipment. Les Mug Cakes seront le retour. 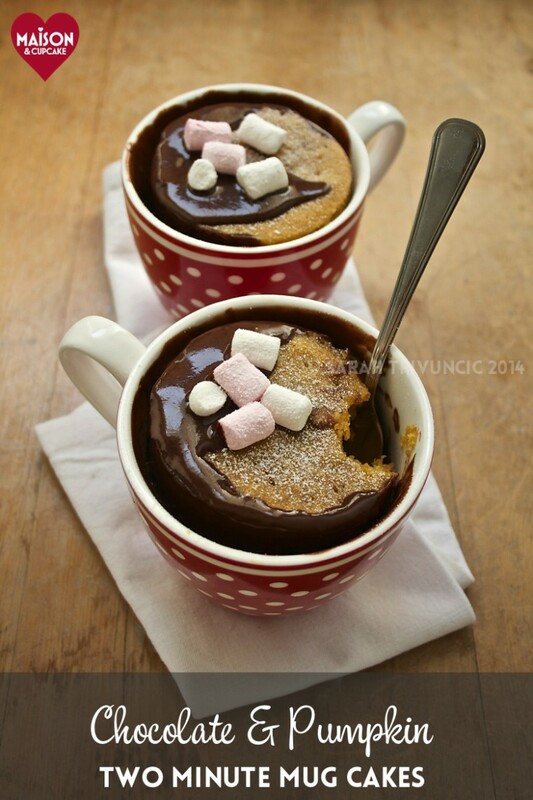 This mug cake recipe is a very large serving suitable for two people. Melt the butter in a 20 second burst or two in the microwave. Stir the sugar into the butter. Break in the egg and stir again. Spoon in the flour and beat. Spoon in the pumpkin puree and beat until mixed through. Immerse a heaped teaspoon of Nutella into the batter. Microwave on full power for two minutes. Melt the chocolate, again in short bursts. Pour over. Scatter with mini marshmallows and icing sugar and serve. 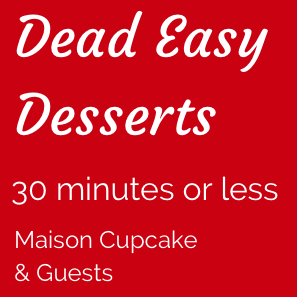 Today’s recipe is my entry to Dead Easy Desserts, currently being hosted by Nazima at Franglais Kitchen and it’s also my Recipe of the Week for Emily at A Mummy Too. I LOVE “Qui sera….” and now you’ve reminded me to figure out how I can watch it from here! Oh and that mug cake? Yes please! Yes I was amazed to see so many full episodes on YouTube and now I can watch those via my smart telly too I can catch up on Series 1. Try it! They’re insanely easy, I’m going to make them all the time now! Lovely mug cake Sarah! I often make a vegan mug cake for one which nicely gets round the egg problem. i was astonished at all those mug cake books we found in France! I know! Carrefour in Calais had loads of them! Wowwww, love the chocolate oozing round the sides! Looks gorgeous! They’re more like steamed sponge, I think you need something gooey alongside. I need to try chocolate sponge ones, I reckon they would be pretty good as chocolate sponge has more substantial texture. Well the first banana attempt was very pallid. I reckon they need chocolate or custard with them. And although this flies in the face of the “ready immediately” thing, actually they keep well in the fridge and when reheated with some cream poured over they come out like steamed sponge. I’m converted! One last tip – did I say use light brown sugar here – am off to amend the recipe box as I reckon light brown sugar helps too. Re puree, yes Waitrose often do it in Sept/Oct but not rest of year so buy eight cans! love qui sera too – though saw it last year and not caught this season. Must watch it as it is so impressive! I think the pastry section is the most challenging and technical and always love that end of the menu when fine dining opportunities arise!! not made mug cakes but with your gorgeous recipe, styling and photos I am considering this as a weekend activity with the kids. lets see if ours are as pretty!! I have been obsessed with the idea of making mug cakes since I saw a spread about them in the metro. And since I have tons of pumpkin puree I might just start with this one. Always good to stock up on pumpkin puree whilst it’s on sale! 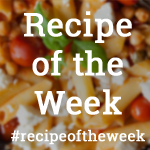 I shall give my kids this recipe and let them loose. They adore puts in mugs and if it looks half as good as yours I will be in for a treat. Gorgeous idea! They look great Sarah. Spookily just bought a book on mug cakes this weekend and am going to have a bash at them myself!